Most people in the supercomputing business are familiar with using FLOPS as a proxy for how fast or capable a supercomputer is. 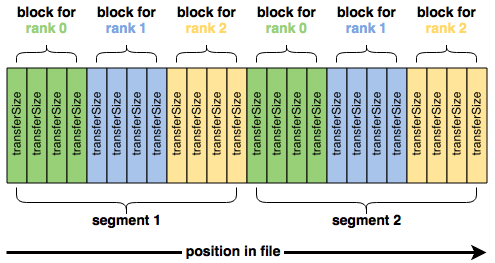 This measurement, as observed using the High-Performance Linpack (HPL) benchmark, is the basis for the Top500 list. However, I/O performance is becoming increasingly important as data-intensive computing becomes a driving force in the HPC community, and even though there is no Top500 list for I/O subsystems, the IOR benchmark has become the de facto standard way to measure the I/O capability for clusters and supercomputers. Unfortunately, I/O performance tends to be trickier to measure using synthetic benchmarks because of the complexity of the I/O stack that lies between where data is generated (the CPU) to where it'll ultimately be stored (a spinning disk or SSD on a network file system). In the interests of clarifying some of the confusion that can arise when trying to determine how capable an I/O subsystem really is, let's take a look at some of the specifics of running IOR. we can only get a couple hundred megabytes per second out of a Lustre file system that should be capable of a lot more. This is in large part because letting each MPI process work on its own file cuts out any contention that would arise because of file locking. 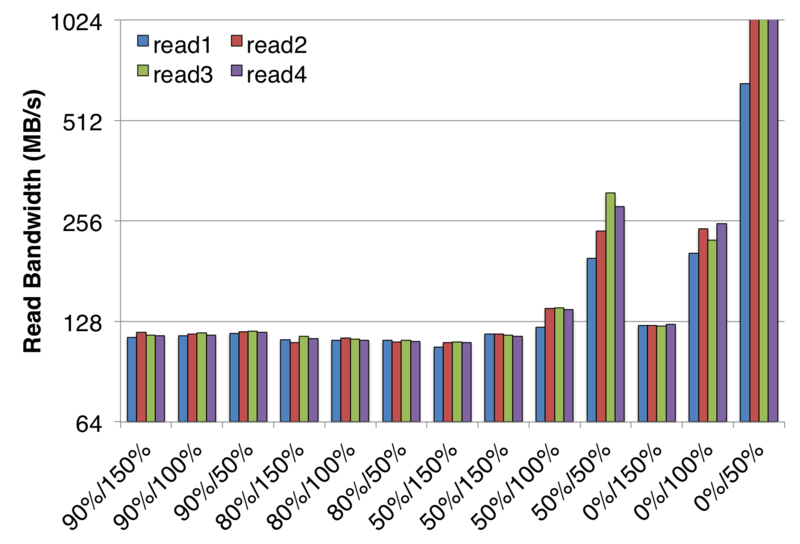 However, the performance difference between our naive test and the file-per-process test is a bit extreme. In fact, the only way that 146 GB/sec read rate could be achievable on Lustre is if each of the four compute nodes had over 45 GB/sec of network bandwidth to Lustre--that is, a 400 Gbit link on every compute and storage node. What's really happening is that the data being read by IOR isn't actually coming from Lustre; rather, files' contents are already cached, and IOR is able to read them directly out of each compute node's DRAM. The data wound up getting cached during the write phase of IOR as a result of Linux (and Lustre) using a write-back cache to buffer I/O, so that instead of IOR writing and reading data directly to Lustre, it's actually mostly talking to the memory on each compute node. writing data to a copy of the file that is cached in memory. If there is no copy of the file cached in memory before this write, the parts being modified are loaded into memory first. 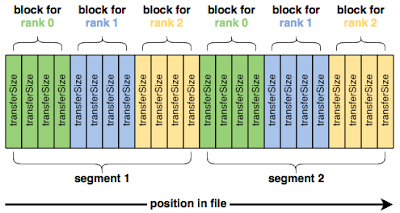 those parts of the file in memory (called "pages") that are now different from what's on Lustre are marked as being "dirty"
Then when the read phase of IOR follows the write phase, IOR is able to just retrieve the file's contents from memory instead of having to communicate with Lustre over the network. However, this can make running IOR on systems with a lot of on-node memory take forever. A better option would be to get the MPI processes on each node to only read data that they didn't write. For example, on a four-process-per-node test, shifting the mapping of MPI processes to blocks by four makes each node N read the data written by node N-1. Since page cache is not shared between compute nodes, shifting tasks this way ensures that each MPI process is reading data it did not write. 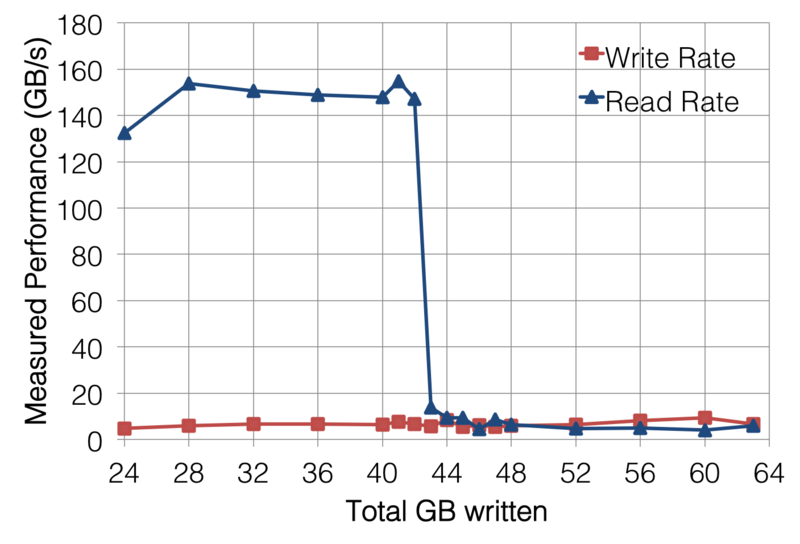 But now it should seem obvious that the write performance is also ridiculously high. And again, this is due to the page cache, which signals to IOR that writes are complete when they have been committed to memory rather than the underlying Lustre file system. To work around the effects of the page cache on write performance, we can issue an fsync() call immediately after all of the write()s return to force the dirty pages we just wrote to flush out to Lustre. Including the time it takes for fsync() to finish gives us a measure of how long it takes for our data to write to the page cache and for the page cache to write back to Lustre. and we finally have a believable bandwidth measurement for our file system. Since IOR is specifically designed to benchmark I/O, it provides these options that make it as easy as possible to ensure that you are actually measuring the performance of your file system and not your compute nodes' memory. That being said, the I/O patterns it generates are designed to demonstrate peak performance, not reflect what a real application might be trying to do, and as a result, there are plenty of cases where measuring I/O performance with IOR is not always the best choice. There are several ways in which we can get clever and defeat page cache in a more general sense to get meaningful performance numbers. When measuring write performance, bypassing page cache is actually quite simple; opening a file with the O_DIRECT flag going directly to disk. In addition, the fsync() call can be inserted into applications, as is done with IOR's -e option. and in fact, this is often good practice before running any benchmark (e.g., Linpack) because it ensures that you aren't losing performance to the kernel trying to evict pages as your benchmark application starts allocating memory for its own use. The effect of passing POSIX_FADV_DONTNEED using posix_fadvise() is usually that all pages belonging to that file are evicted from page cache in Linux. However, this is just a hint--not a guarantee--and the kernel evicts these pages asynchronously, so it may take a second or two for pages to actually leave page cache. Fortunately, Linux also provides a way to probe pages in a file to see if they are resident in memory. The above diagram shows the measured bandwidth from a single node with 128 GiB of total DRAM. 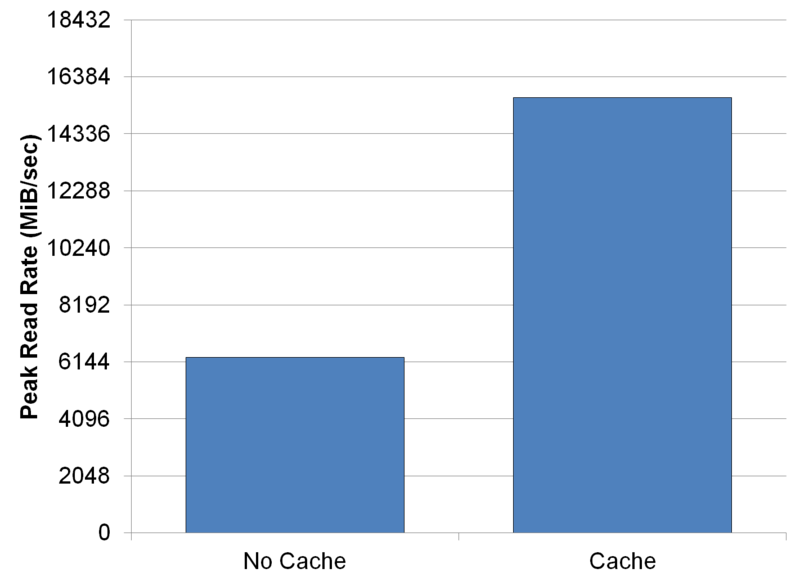 The first percent on each x-label is the amount of this 128 GiB that was reserved by the benchmark as application memory, and the second percent is the total write volume. 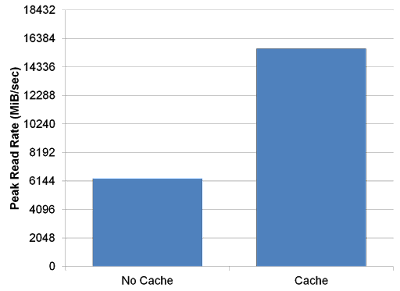 For example, the "50%/150%" data points correspond to 50% of the node memory (64 GiB) being allocated for the application, and a total of 192 GiB of data being read. This benchmark was run on a single spinning disk which is not capable of more than 130 MB/sec, so the conditions that showed performance higher than this were benefiting from some pages being served from cache. 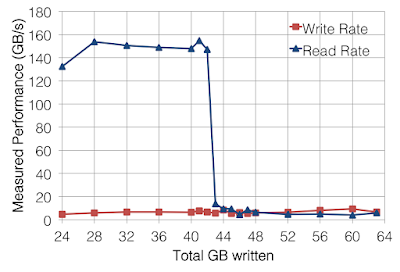 And this makes perfect sense given that the anomalously high performance measurements were obtained when there was plenty of memory to cache relative to the amount of data being read. 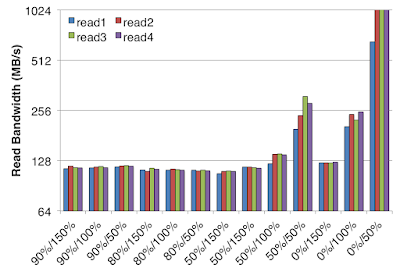 Measuring I/O performance is a bit trickier than CPU performance in large part due to the effects of page caching. That being said, page cache exists for a reason, and there are many cases where an application's I/O performance really is best represented by a benchmark that heavily utilizes cache. Thus, letting the page cache do its thing is often the most realistic way to benchmark with realistic application I/O patterns. Once you know how page cache might be affecting your measurements, you stand a good chance of being able to reason about what the most meaningful performance metrics are.